Congratulate ICAN on the Nobel Peace Prize! On December 10, the International Campaign to Abolish Nuclear Weapons (ICAN) will receive the Nobel Peace Prize in Oslo, Norway. 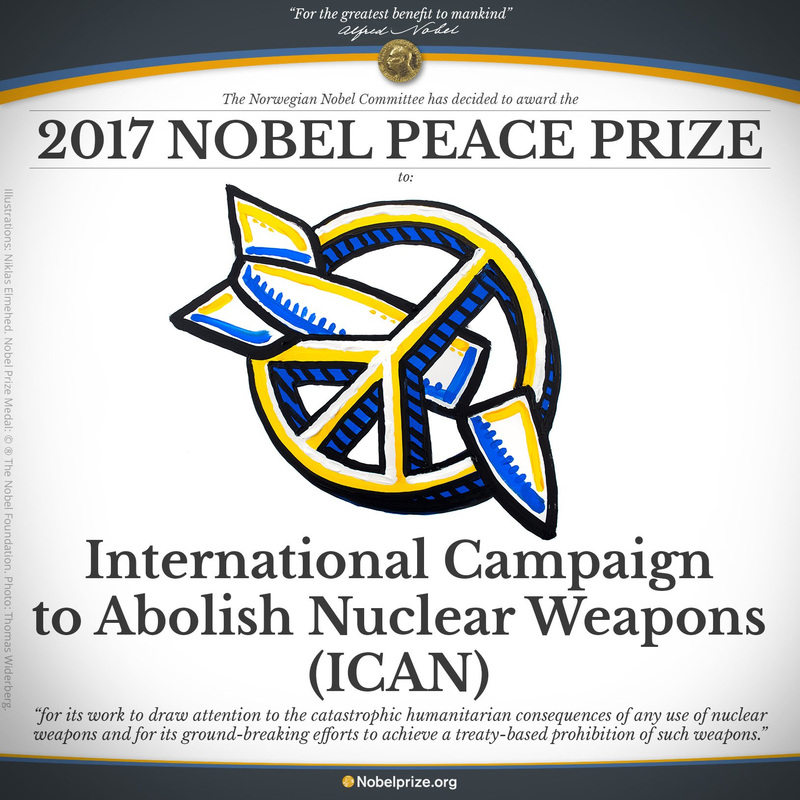 The Nobel Committee awarded ICAN "for its work to draw attention to the catastrophic humanitarian consequences of any use of nuclear weapons and for its ground-breaking efforts to achieve a treaty-based prohibition of such weapons." ICAN is made up of over 450 Partner Organizations, including the Nuclear Age Peace Foundation, from 101 countries. On Sunday, ICAN's Executive Director Beatrice Fihn will accept the prize together with Setsuko Thurlow, a survivor of the U.S. atomic bombing of Hiroshima. ICAN stands in stark contrast with those national leaders and their allies who possess nuclear weapons and have been unwilling to give up their claim on them for their own perceived national security. But ICAN is on the right side of history, because those with nuclear weapons threaten the future of civilization, including their own populations. ICAN well deserves the Nobel Peace prize. The campaign is effective. It is youthful. It is hopeful. It is necessary. May the Nobel Peace Prize propel it to even greater accomplishments. And may it awaken people everywhere to the threat posed by nuclear weapons, and the need to ban and eliminate them. Please join us in congratulating ICAN on this historic achievement! Source: The Nuclear Age Peace Foundation.